Thus, you can already find it in the Play Store. 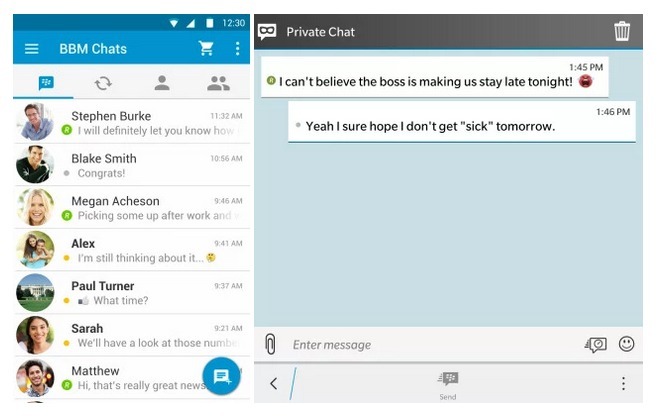 But the new paint job isn’t the only changed thing about BBM for Android. It also comes with a new feature called Private Chat. This was basically created as a response to people taking screenshots of sensitive messages. BBM previously introduced timed pictures that self-destruct after a while, but those aren’t immune to people taking screenshots of them before they go away. Similarly, you can retract a message in BBM but if the person you sent it to takes a screenshot of it, that’s pretty much pointless. Private Chats feature no user names and no profile pictures. What’s more, these are automatically ended after “a short period of time”. In this case, a screenshot will prove pretty useless since without a name or picture attached to a message you can’t really prove who said what. The feature is included in the new Privacy and Control subscription, which replaces the Timed and Retracted Messages subscription. If you choose to pay for the Privacy and Control subscription, you’ll get support for timed messages and pictures, retraction of messages and pictures, as well as editing messages after you’ve sent them, alongside Private Chat of course. The entire bundle costs $0.99 per month. Those who already subscribe to Timed and Retracted Messages will be upgraded to the new subscription without paying anything extra.